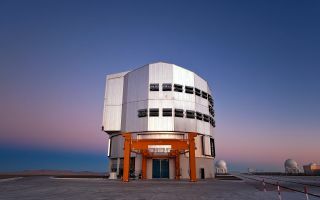 Before another clear, starry night falls at ESO's Paranal Observatory, home of the Very Large Telescope (VLT), the sky produces a palette of intense colours, putting on a beautiful show for observers. Before another clear, starry night falls at ESO's Paranal Observatory, home of the Very Large Telescope (VLT), the sky produces a palette of intense colours, putting on a beautiful show for observers as seen in this beautiful space wallpaper.These colours can only be seen with such depth from sites such as Paranal, where the atmosphere is extraordinarily pure. Looking to the west, over the Pacific Ocean, the sunset sky turns bright orange and red. However, this photograph shows the view to the east instead, looking away from the Sun after it has just set. The grey-bluish shadow above the horizon is the shadow of our own planet. Above this is a pinkish glow known as the "Belt of Venus", a phenomenon produced by the reddened light of the setting Sun being backscattered by the Earth's atmosphere.